Regular lab work allows your pet’s doctor to assess symptoms he/she cannot see or feel, such as indicators of liver disease or diabetes. In healthy pets, blood work helps doctors establish a “baseline” for each individual dog or cat. A baseline blood panel determines what is considered “normal” for a particular pet. This is especially important if the pet becomes ill because it helps the doctor to more accurately interpret any changes in blood work results. Performing blood tests on healthy pets can also detect underlying problems, which your veterinarian may be able to treat before they become a bigger issue. Even slight changes in body chemistry could signal a problem that may be easily managed. Can I Tell If My Pet Needs Lab Work? 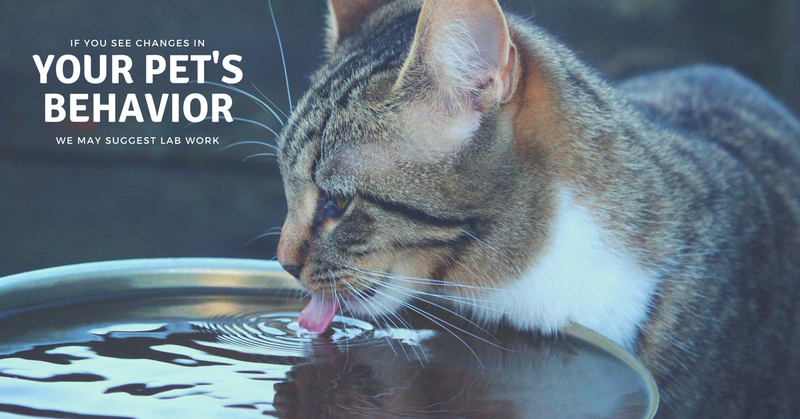 If you see any changes in your pet’s behavior, like increased thirst or urination, loss of appetite, weight loss or lethargy, it may be a sign that he/she needs blood work. These could be signs of all sorts of issues, minor or major. So be sure to schedule an appointment if you notice such changes. What Kinds of Tests Might My Pet Need? Typical lab work includes a complete blood count (CBC), serum chemistry, and a urinalysis. A CBC provides information on hydration status, anemia, infection, blood clotting ability, and immune system response. This test is essential for pets that have symptoms like fever, vomiting, diarrhea, weakness, pale gums, or loss of appetite. Prior to surgery, a CBC can detect bleeding disorders or other unseen abnormalities that could cause problems with anesthesia. A chemistry panel screens for metabolic disease. Liver function, kidney function, protein levels, and glucose levels are assessed as part of a general health profile. A thyroid hormone level should be checked annually in older dogs and cats as well. A urinalysis tests the concentration and pH of a pet’s urine and checks for red blood cells, white blood cells, protein, bacteria, crystals, and casts in the urine. Our complete in-house laboratory lets us run these tests during routine or illness care visits, and we can receive immediate results for pets with emergency or urgent care needs. We also work with an external laboratory that can provide most results within 24 hours for all other types of tests. For cats and dogs, we recommend one blood panel before six months of age and then every one to two years as needed. Annual labs are recommended for all pets over eight years of age. All of our recommendations, of course, depend on the needs of your individual dog or cat. So be sure to contact us with any questions or to schedule your pet's appointment.